Thermomix, a multifunctional kitchen appliance, that has delighted millions of homes around the world for over half a century, is now officially in Malaysia. Consumers can experience Thermomix by simply booking a cooking demonstration via its website or hotline . With its innovative Recipe Chips, touchscreen and unique Guided Cooking function, the Thermomix makes food preparation and cooking even easier. Everyone can cook with their fingertips . It’s latest model, the Thermomix TM5, continue to redefine cooking by going digital . “Thermomix is revolutionalising cooking in the kitchen with technology” said JC Lim, Executive Director, Thermomix Malaysia. “The introduction of the innovative Recipe Chip which stores hundreds of recipes full colour touchscreen controls and the Guided Cooking function, represents the future of cooking . 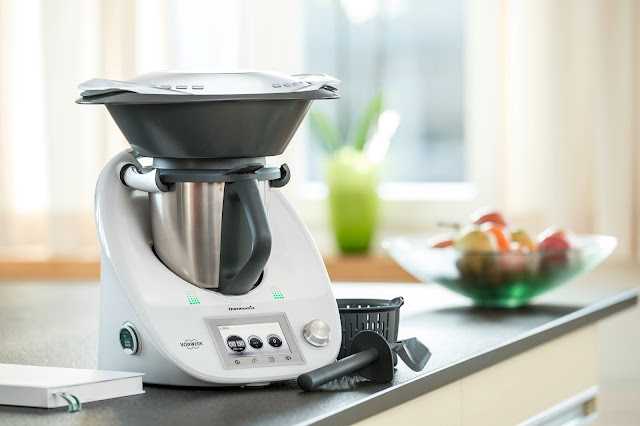 With the cooking process made simpler, Thermomix will enable all families to cook effortlessly. “Today, we are also very pleased to show everyone how 6 traditional Chinese dishes nay be prepared under 30 minutes effortlessly in what we called the future way of cooking,” added JC Lim . The Vorwerk Thermomix is available for RM6,488 (w/GST). The long anticipated cook book in both English and Chinese language on Southeast Asian influenced Chinese cooking is finally shipping. “This book, a collaboration between Olivia Tan and Thermomix Malaysia will continue to delight Thermomix fans around the world, to develop a deeper appreciation of Straits Chinese style cooking which is uniquely flavourful due to the pervasive use of spices and ingredients from the region.” JC Lim, Executive Director, Thermomix Malaysia . “These are my family’s favourite dishes - a compilation of rich and authentic heritage Straits Peranakan influenced Chinese recipes. I have included a section that introduces key ingredients crucial to recreate the same tastes with the Thermomix.” says Olivia, who is of Chinese Hakka and Malaysian Nyonya descent. Cooking is a lifelong passion that first developed when Oliva was only nine, when she discovered her love for food, and started cooking and baking at home. Once she won her first cooking competition at eleven, there was no turning back. Over the years, Olivia never stop cooking and learning. She studies the different styles of cooking from different cultures, to perfect her cooking techniques, and the use of different ingredients to effect positive impacts on health and wellbeing . Olivia holds a Bachelor of Arts (Hons) International Business, and a Certificate of Health, Diet &amp; Nutrition from the UK. “Cooking a well balanced meal for my family is important. I also strongly believe that growing children should be given homemade, unprocessed and preservative-free foods.” added Olivia . Today we had been invited to this priceless event and had the chance to cook with Oliva , She showed us how easy and effortless it is to cook eight dishes in 40 minutes with the Thermomix . and the foods was totally delicious that cooks by Thermomix , no messy kitchen . an awesome stuff that need to be in your Kitchen .